Last month I raved about Sunumbra Sunscreen SPF 30, a physical sunscreen that protects your skin from the harmful sun’s rays but without leaving an unattractive white cast behind. Its only flaw, if so it can be called, is its somewhat greasy texture that takes a few minutes to sink into the skin. 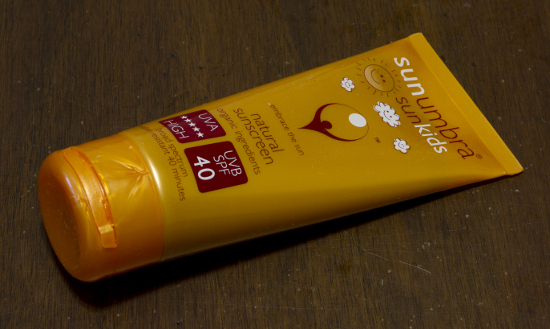 This isn’t a problem for me, but if you’re looking for a sunscreen that dries instantly, then you’d better opt for Sunumbra Sunkids SPF 40, which can be used safely by both children and adults. But there’s a catch. The sunscreen has a very lightweight texture which does mean that it sinks in immediately, but also that it isn’t very moisturizing. It won’t dry out your skin, but it won’t hydrate it either, which makes it more suitable for people with combination and oily skin types than for those with dry skin. The sunscreen is also brownish in colour so there’s no risk of it leaving a white cast on the skin. It doesn’t leave a brownish one either. The active sunscreen agent in Sununbra Sunkids SPF 40 is Zinc Oxide, which protects against the entire UV spectrum on its own. It is also very gentle and doesn’t irritate skin. Here, Zinc Oxide is coated with Dimethicone to make it photostable, and thus effective for longer. Its long-lasting and water resistant properties are also enhanced by Carnauba Wax, which helps prevent it from melting at high temperatures. Furthermore, Sorbitan Olivate, an emulsifier derived from oil, allows Zinc Oxide to be dispersed more easily and evenly on the skin. According to the company that makes it, “it can improve the homogeneity of the sunscreen giving better efficacy and stability performance”. But that’s not all. The sunscreen also contains a bunch of natural extracts, including broccoli sprout extract, black tea extract, allantoin, astaxanthin, green rooibos extract and kigelia extract, that help prevent sun damage and the premature signs of aging. Astaxanthin, a dark red carotenoid pigment present in the skin and tissues of several animals such as salmon and lobster, is also, according to Truth In Aging, an “efficient absorber of specific ultraviolet sunlight rays that may contribute to skin aging and cancer.” It also has anti-inflammatory and antioxidant properties. Kigelia Fruit Extract, derived from the big fruits of the kigelia africana plant cultivated in sub-Saharan Africa, also has antioxidants and anti-inflammatory properties. Green Roboois Extract is another powerful antioxidant, while Allantoin has soothing properties. Antioxidants fight free radicals, which are one of the main causes of premature aging, helping you to keep wrinkles and fine lines away for longer. Ingredients with anti-inflammatory properties instead calm and soothe irritations, making this sunscreen suitable for people with rosacea and sensitive skin too. Overall, this is one of the best sunscreens I’ve come across. It protects your skin from the entire UV spectrum, it is chockfull of antioxidants to help prevent the premature signs of aging and has anti-inflammatory properties that soothe skin. Because of this, it is suitable for all skin types, even those with very sensitive skin. However, if yours is dry, you’ll have to use a rich moisturizer in conjunction with it. And, unlike Sunumbra Sunscreen SPF30, this one doesn’t stink of broccoli. Its herbal scent isn’t very strong and fades quickly. Ethylhexyl Olivate, De-Ionized Water, Zinc Oxide Dimethicone, Sorbitan Olivate, Carnauba Wax, Allantoin, Aloe Ferox Extract, Astaxanthin, Black Tea Extract, Broccoli Sprout Extract, Green Rooibos Extract, Kigelia Extract, Milk Thistle Extract, Cape Chamonile. Sunumbra Sunkids SPF 40 has a lightweight texture that sinks immediately into the skin, without leaving a white cast behind. Its Zinc Oxide formula, enriched with natural extracts, will help prevent and reduce sun damage and the premature signs of aging, and soothe skin. However, it may not be moisturizing enough for those with dry skin. Im always looking for pure mineral sunscreens that have an spf of at least 40 and are not greasy so this is an excellent option. But do you think it has enough zinc oxide?, or do you think theres a way to check with the manufacturer?. Hello Alejandra – If you are looking for an SPF40 then the sunumbra sunkids is certified at SPF40+, effectively meaning that the zinc oxide present has been tested and found to be sufficient enough to provide the protection level you are looking for. Hello Alejandra. I am not sure how to answer your question specifically, apart from to say that the percentage of zinc oxide used in the SPF40 products is 19%. They are all also fully certified using the ISO / COLIPA/ FDA standards required. Some additional protection is offered through some of the botanical ingredients which also provide a boost to your own body’s internal protection capabilities. Contact us directly anytime with further queries as we are always very open to sharing information. I wish I could try this one 🙂 ! I will definitely look into this, it’s on the pricier side for me but worth it if it does work, as ss is one of the most important in skincare. The ing. list looks good, I just hope it’s not too dry for my slightly dry skin! Reading further…. WOW I WANT this sunscreen! It has so many nice ingredients in there. I have never even heard of astaxanthin or broccoli sprout extract. You teach me so much, seriously! I feel less smart when I don’t read your blog. Time to catch up I promise. No worries about replying to all my comments! 🙂 I know you read them anyway. Janessa, this is a wonderful sunscreen and very well-formulated. I love that they have treated Zinc Oxide in a way to make it more effective and more pleasant to use, and that every ingredient has a purpose. A lot of companies don’t pay that much attention to their formula, but only demand the inclusion of this or that ingredient, even when it isn’t something necessary, to attract consumers. I’ve read other reviews that say the kids version can leave brown stains on white garments. Not sure if it’s true, but I’m debating whether to order the 30 version or the kids version – have oily skin but it would be really annoying to end up with stains on my clothing. Has anyone else noticed a problem with the kids version staining? Tiyo, personally I have never experienced any staining, but then I’m not sure I’m the best person to ask. I rarely wear white clothing and am very careful with application. Both versions are tinted though, so potentially, this could be a concern. The brand has recently released Sumbumbra sport and Sunumbra daily sunscreen, which aren’t tinted. I haven’t tried them yet, so I’m not sure if their textures are suitable for oily skin (of the other two, Sunkids would be better for your skin type), but they are a creamy, off-white colour, so they shouldn’t stain. Forgot to say that I’ve been using the sport40 version for awhile and it works well, just a bit thick/harder to rub in, it goes on greasy at first. Tiyo, oops just seen this. I’m glad the sport version is working well for you. Zinc oxide is quite thick and can be a bit uncomfortable at first, but if it doesn’t last long, and you’re concerned about the staining, you may want to stick to this version. It feels like at the end of the day i am not removing the sunscreen thoroughly from my skin. I use bioderma Sensibio to remove makeup and sunscreen, followed by la roche posay physiological gel. There are white bits if i look closely at my skin. Not sure if its because my skin is dry. What do you use to remove physical sunscreen? Ying, I’m sorry you are having problems removing you sunscreen. I use an oil-based makeup remover, sometimes even just olive oil. It works very well for me. Can you use this sunscreen on the face also. Melisha, yes, you can. I do it all the time, and never had any problems. You’re right…definately not for dry skin. It makes my skin feel look and feel pasty (especially on the face) . Since it’s tinted and i have sensitive skin….I actually broken out with pimples because of this sunscreen….Its the first time I ever broke out before. Lola, oh no, so sorry to hear that! That just goes to show how different we all are and have even well-formulated sunscreens don’t work for everyone. Thats true! Do you have any recommendation for a sunscreen that is specifically for the face? Lola, have you tried Paula’s Choice? She has several sunscreens that are specifically for very dry skin. You may also want to check out Badger Balm. They’re natural and usually good for sensitive skin. Hope this helps. My pleasure. Let me know how you like them! For me this is not good, as I wanted to completely avoid any fragrances (talking about the last two, geranium and cedarwood oil). But using it for three days now I had no negative reaction and guess I will keep on using it as long as nothing bad happens. Minn, thank you for bringing this to my attention. I have run out of this old bottle a long time ago now obvs but I don’t remember these ingredients being listed there. I always check the label against the ingredients on a brand’s website to make sure they match (sometimes, as you know, the brand also mentions the key ingredients). So, I’m thinking they may have slightly reformulated the sunscreen? I think so too. I don’t remember any post, so which sunscreen are you using now? Hi Gio, would you still recommend this sunscreen even though the formula has changed slightly? Suzanne, not for sensitive skin. But if you’re not bothered by fragrance, than yes.